Paneer and potato both are amongst the most versatile ingredients in the kitchen. They are used in snacks, in mains, in parathas, and sometimes also in desserts! In this delicious curry, they come together to make totally yum, soft, and spicy koftas. In fact, don’t be surprised if half of your kofta get over even before they go into the curry! The masala curry is a simple onion and tomato based gravy, which can be used as a base for many dishes. You can also add some cashew paste to the curry to make a more creamier, malai paneer curry. Paneer is a vegetarian’s delight. Did you know paneer is called cottage cheese because it is one of the simplest cheese to make at home? Just curdle milk with lemon juice, yogurt, or vinegar. Drain the curdled milk and the press. I always add the whey or the leftover water from making paneer into the curry. It adds to the flavour and the creaminess of the curry. No Indian dinner party is complete without a paneer main dish. I often make this kofta curry for festive gatherings. It is super simple to make, delicious, and looks like a lot of effort has been put into it! So get ready for compliments when you serve this one in your next party. * In a big bowl, combine together grated paneer, potatoes, ginger, coriander, and all the spices. Shape into small balls. * Heat oil in a deep kadhai on medium-high heat. 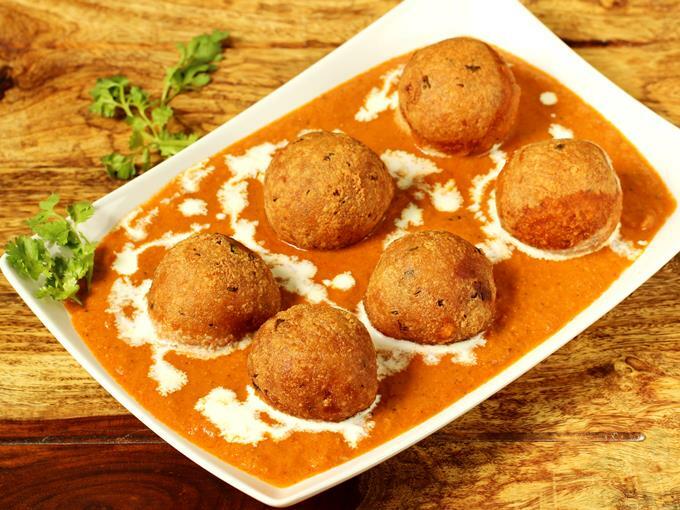 * Once the oil is hot, fry the koftas, a few at a time so as to not crowd them in the kadhai. Turn over to ensure they cook evenly. * Remove on a kitchen towel. * Heat oil in a pan. Once hot, add hing and cumin seeds. * When the seeds start to sputter, add green chillies and ginger-garlic paste. Sauté for a minute and then add the chopped onions. * Mix well and cook the onions for a couple of minutes, till they start to soften. * Add the tomatoes and all the spices. Mix well and cook covered on medium heat for 5 minutes. * Remove from heat and directly in the pot, blend the gravy to smooth using a hand blender. Be careful because the hot gravy might sputter. * Just before serving, add the koftas to the curry. Serve hot.